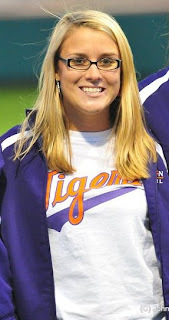 Being an avid baseball fan and lifelong softball player, I couldn’t pass up the amazing chance to interview for a position as a Clemson bat girl. Unfortunately, Clemson doesn’t have a softball team, so this was the closest chance I would have to still being close to the game, besides sitting in the outfield stands with the rest of the Clemson student body. With over 75 girls showing up for interviews and only 5 spots available, I wasn’t optimistic, but I was confident that my knowledge of the sport would automatically move me in front of some other girls who may have been there for the wrong reason. I mean, can you blame them? Have you seen boys in baseball pants before? :) I was pleased when the interview questions were strictly baseball related! Luckily, I knew all the answers and felt the interview was successful. Later in the day, I found out I was one of the 5 selected! The season started February 18th and I have loved every minute of it! The job is relatively easy and tons of fun. We are responsible for getting foul balls that stay in play, picking up the bats near the plate after a player’s at bat is over, and taking the umpires more balls and water. The whole game we sit at the very edge of each dug out, right near the on deck circle. I never realized what I was missing out on until I traded in my outfield student seat for an amazing view from the dugout. Not only is the view of the game amazing, but it’s awesome to hear the banter and encouragement amongst the players and see their emotions change at different points of the game. It’s really cool to see the camaraderie and how close the guys are. Hearing their nicknames and the stories behind them are pretty hilarious too. :) I actually get to see them as people and not just jock-y athletes, which I love. We are allowed to interact with the players a little, but we usually don’t talk to them during the game. As the season has progressed, most of the bat girls have learned their names, positions, hometowns, majors etc and vice versa. However, bat girls are NOT allowed to date the players, which I think a lot of people don’t know. The guys are all very nice and fun to be around. Many games after working some innings in the visitor’s dugout I gain a greater appreciation for the kindness and gratitude of our players. They all appreciate our time, hard work, and dedication, as we are NOT paid to be bat girls. Our work is strictly volunteer and a big commitment for us. There are 10 girls and only about 4-6 needed each game, so we all signed up for games we knew we could work around our school schedules, going home, etc. I work as many as I can because I love doing it. Also, it’s been so awesome meeting other girls who share the same appreciation for the game as I do. We all get along great and have a lot of fun together. Are you a Clemson Girl who has a story to tell? Contact us at clemsongirlblog@gmail.com with your idea and you could be a guest blogger for Clemson Girl too! I have dependably had an affection for the sport of baseball. As a child, I played Little League additionally conveyed my glove and bat with me pretty much all over the place for a snappy pickup amusement whether it was before or after school, or amid break. Certainly Baseball gloves are so important equipments . Baseball is a great game. There are many phases of it that are not easy to master, though. It takes a lot of practice to learn how to hit a baseball well and it also takes a lot of practice to learn how to field a baseball too. You also have to have the right equipment when doing these things too.